Bullying is becoming more of a problem with school-aged kids. 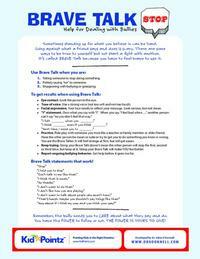 Bullies, as well as the children they are bullying need help changing their behavior. Bullies are not born, they are made and there are things parents can do to help their child. With the web and internet woven into our lives, cyber bullying can be just as harmful as old fashioned bullying at school. These tools to help parents were developed by Dr. Adria O’Donnell, a licensed clinical psychologist specializing in children and adolescents and teen girls. Kids cannot be expected to respond perfectly to a bully the first time, no matter how much we talk to our kids about it. What really helps is to role play bullying situations with kids. 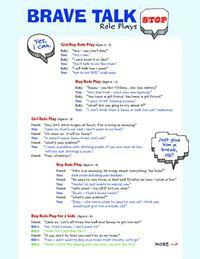 These role plays will help you kids deal with bullies. Girl bullies and boy bullies require different techniques. Whether your child is in kindergarten, grade school, a tween or teen, these role plays will help them deal with bullying situations. 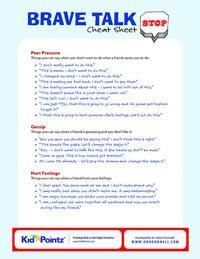 Help kids learn what to say when they don’t want to do what a friend wants them to do. Kids know what peer pressure is, but as a parent, you can help your child know what to say and how to say it so they feel good about themselves. Whether your child gets hurt feelings from words her friend uses, or just wants her friend to stop gossiping about someone else, you can help them find the words to use. Parents who have children who are being bullied just want it to stop. The kids want it to stop as well, but sometimes they just don’t have the right words, tone of voice, or even the right eye contact and body language. Whether your child is being bullied in school or at the playground, or just by another kid in the neighborhood, you can give your child the tools to make the bullying stop.